Good morning! That such a nice title for this blog post, don't ya think? Never fear when angels are near. V Peachy Keen Stamps just had a release and blog hop a couple of weeks ago, and this cute Pk-331 Our 2 Angles In Heaven stamp set was one of the releases. This is a very special stamp set to us, as this set was lovingly created by Kathy and Dave Jakopovich in memory of Michael and Annmarie Buttafuoco. Two beautiful children who lost their young lives in a horrific traffic accident. Michael and Annmarie are the children of our fellow DT member Lisa Buttafuoco. $15.00 from every one of these stamp sets sold is being set aside to be donated to Make A Wish Foundation. This began when this set was released, and the final tally will be donated on Christmas Day, 2010. Please consider adding this very special stamp set to your collection, knowing that by doing so, you are helping to make the dreams of a child come true, in memory of Lisa's beloved children, Michael and Annmarie. 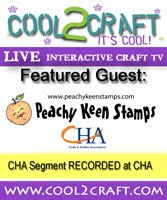 You can find all the information on the Peachy Keen Stamps website, or by visiting Lisa's Blog www.our2anglesinheaven.blogspot.com. Please note: There are no global discounts available on this particular stamp set, due to the profits being donated to charity. So, today, our challenge at PKS is to create a card/project that centers around encouragement. I know that I promised a video for this challenge, and believe me, when I tell you that I DID do one, however, my Flip camera was acting up, and wouldn't hold a charge, and in the process of trying to replace batteries, apparently, my footage didn't get saved, and with the battery change, came an empty camera. I've told you before that I'm technically challenged, and I'm NOT wrong!! I think my rechargeable battery pack is no good, and it's only a few months old. I will do another video for this challenge, and I'll add it to this post as soon as I have it finished. I stamped these sweet little angels in Memento tuxedo black ink, and colored them with my Copic markers, trying to keep a monochromatic color scheme going with the boy in blue and the girl in pink. Their wings were colored, then covered with 2-Way Glue Pen and sprinkled with dazzling diamonds glitter. The designer paper is from Basic Grey's Two Scoops line, and the pearl embellishments are from Zva Creative. The card stock and ribbon are both from Stampin' Up!. Now for the glittery panel, I wanted to point out that I made my own glitter card stock, by stamping the panel all over with Versamark ink, and sprinkling it with heat and stick powder. I took my heat embossing gun and heated the powder until it melted and became sticky, then covered the entire thing with dazzling diamonds and heat set once again. It makes beautiful background with sparkles that stay in place. Head over to the Peachy Keen Challenge Blog to see what our talented design team has created for you, and be sure to visit our Guest Designer, Mandy Ferg who has some amazing creations to share with you as well. I also want to note that with Thanksgiving comes the annual 4-Day Thanksgiving Holiday Sale at Peachy Keen Stamps. Hop on over to their website and find all the details. One more thing to be thankful for! A sale on stamps!!! Wooohooooo!!! Thanks for stopping by today! I'm off to work on that video!!!! Have a blessed day, and happy stamping! This is the most beautiful card, I love ths stamps and their meaning. Just beautiful. TFS! WOW WOW WOW! That's all I can say. This is absolutely GORGEOUS. You colored them perfectly and that glitter on the wings was just the perfect touch. OMG Lorie, this is so beautiful. I like the colors and all the pearls- very sweet image. Beautiful, Amazing, Prefect, and Incredible! Your coloring is so good, I wish I had your talent! Your projects are always flawless and well done! *Gasp*! I'm speechless with admiration for your incredible talent Lorie! I wish more than anything I lived close enough to come and watch you colouring! Fabulous card, just fabulous! Lorie, you blow me away every time! Those papers and ribbons are gorgeous and your coloring is totally awesome every time! This is gooooooooorgeous Lori, so, so cute! Oh Lorie! You colored my angels so beautifully! This card is so gorgeous it brought a tear to my eyes! Well more than one actually, several tears! Your talent is something to be very proud of. If you ever want to give me some I will wait in line and tackle everyone down to get there first! Also, I'm your newest follower..
How sweet! Beautiful layout and love those pearls and the pink and blue ribbon is a nice touch.